I am stuck in a car with four small children. The older children are big (and smart) enough to abandon ship. Just the littles are left hanging with mama. We are at Asher’s football practice which, ridiculously enough, takes two hours a night, four days a week. Have I mentioned that I strongly dislike football? You might even be able to insert a stronger word here if you didn’t have two sons (and a husband) that positively adore the sport. So I’ll stick with ‘strongly dislike’. But you know what I mean. Anyway, we are here, but it’s too cold for them to play outside like they usually do. Not that it’s terribly cold, more that we’re terribly under-dressed for this slight dip in temperatures. As in short sleeves, no shoes. Redneck-esque you might say. So, for fun, since I’m stuck here and all, I thought I’d try to post from my iPhone. I’ve been wanting to try it, but honestly haven’t had the time. Now I do, I just have four kids jumping on my seat and the Backyardigans themesong playing in my ear. So forgive me for the quality, or lack thereof, of my thoughts this afternoon. Not much going on between the ol’ ears, if you know what I mean. Just for even more fun, I’ve thrown in a picture of us here. Stuck on the car. Can you feel it? The fun that is? sounds like you are making some wonderful memories Stephanie! I don't know about you, but they look like they are having a lot of fun! What did soccer moms (or football moms) do before DVD players? The only movie in our car for weeks has been Chitty Chitty Bang Bang which I loved as a child, but it now like fingernails on a chalkboard every time it comes on. It's time for a new selection! Ummm, have you ever had to go to basketball practice. Now that is painful, keeping small children corralled on skinny little sidelines, when there is a full open court with other kids running around.. I "strongly dislike" that one. 2 hours a day, 4 days a week though… your a good Mama!!! dude.. I feel you. bless their hearts they look like they are having the time of their lives!!! This makes me smile BIG!!!! Oh ya, ! 'm feeling it!! Right now I am getting a new hairdo while checking out blogs- this is good!! Sorry about being stuck in the car! We've had to do that with chilly or rainy soccer games. The sport that I dislike strongly is hockey- thank goodness hubby feels the same way! I love the DVD players in the car- they're lifesavers!! I "strongly dislike" football too. Ok…I totally feel ya on the "strongly dislike football" thing…heaven knows Frank has tried to get me into it for, ummmm, 26 years now (!! )…not happenin'…ANYWAY…. 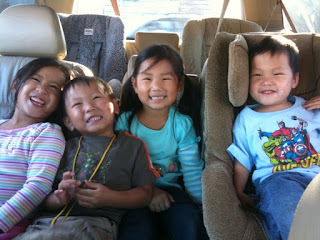 Look at that cute bunch of kiddos in your back seat!! …you are blessed my friend. I so remember those days of sitting in the car while Blake was at football practice. Now that he is in middle school, he is able to walk to and from practice. PTL! Oh, and I totally get the strong word for your lack of love for the game, right there with with ya girl. Oh I have so BTDT but with soccer instead of football!!! Too cute! We have to wait for my oldest daughter an hour 2x a week. Three little ones is plenty for me, I'm REALLY impressed you do four and call it FUN! Congratulations on no typos! I'm so clumsy with my iPhone keypad but also SO thankful to have it now that my life revolves around a carpool lane every afternoon. Oh yes, I can relate. I have many days just like this…the van is our home somedays. So cute and having so much fun!! That is too funny. You write beautifully, even under the most most "difficult" conditions! And on a phone, no less. We leave for China in 24 hours! Yikes. I am impressed… No clue how to do that on my IPhone…. Do we need to go shopping for snow suits yet? You KNOW kids love things like that!!! An as for the "quality" of the post? I really enjoy a peek into the daily, routine life of the Ni Hao Y'all gang! Oh and the Backyardigans ROCK! That car is full of pure sweetness!? What a wonderfully, blessed, normal day you had! Well, at least *they* look like they are having fun. Were they laughing because you were banging your head against the windshield?